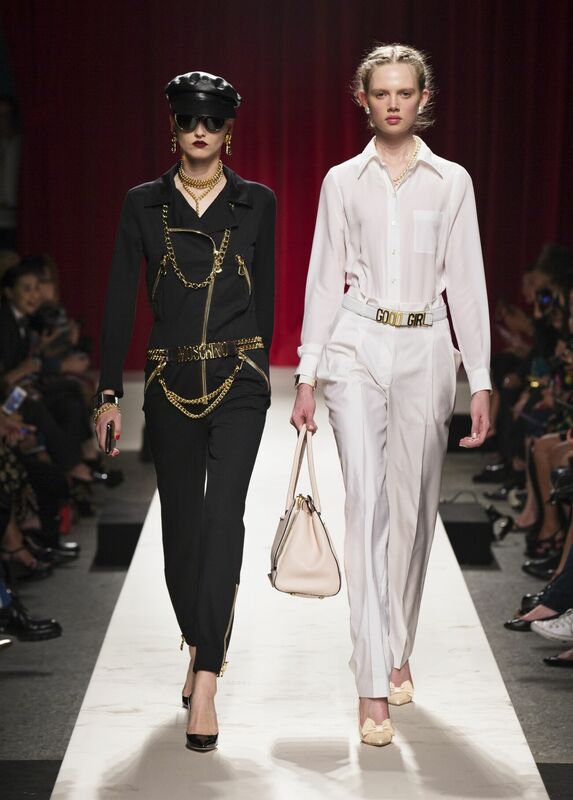 To celebrate the fashion house’s 30th anniversary, Creative Director Rossella Jardini wished to pay tribute to the memory of founder Franco Moschino by re-interpreting all the iconic themes that have inspired his aesthetic vision. She presents an exclusive mise en scène that plays on the double spirit of the contemporary woman, the good and evil. 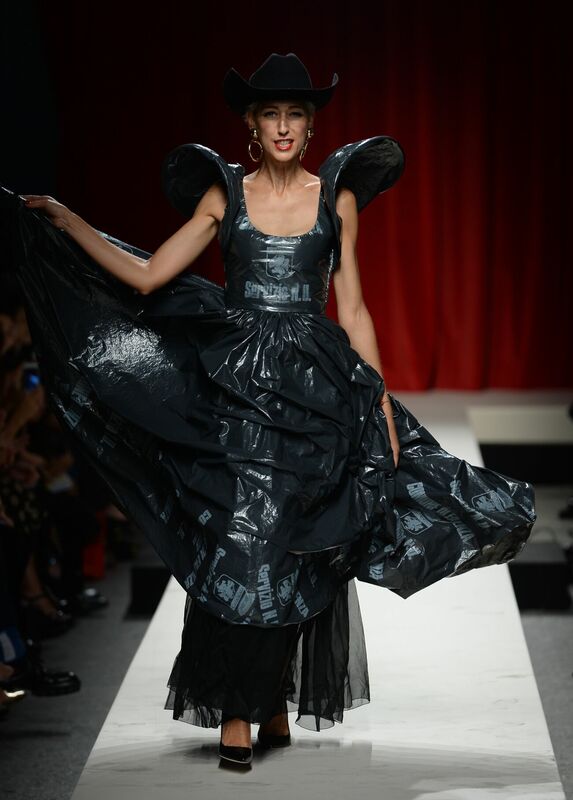 Opening the show are the designer’s 4 favorite models: Pat Cleveland (strapless dress with Italian flag and cow, fall winter 85/86), Violeta Sanchez (coat with teddy bears, fall/winter 88/89), Amalia (Italian flag dress, fall/winter 88/89) and Giselle Zelauy (garbage dress, spring/summer 94) , who wear symbolic garments from the Maison’s archives. Then they leave the scene to the spring/summer 2014 collection with a series of female characters that describe the same woman in her “good” & “bad” versions. The nun, the maid, the playmate, the biker and many other varied personalities reveal a creative duality that alternates street-glam style with a bon chic, bon genre spirit, through a collection that is elegantly easy, accessible and, at the same time, highly refined, and speaks to all women. Between the memory of Franco Moschino and the look towards the present and future of the Maison, Rossella Jardini offers must-have pieces like the leather jacket with a heart or dotted with shiny studs, the iridescent bouclé jacket with large metallic zippers and chain bracelets on the cuffs, pearl embroidery on lightweight, see-through dresses, refining the most delicate looks with patterns of colored roses printed or embroidered on fabrics in white, black and red. Hearts, pearls and chains. Raised lettering with the logo letters in shiny metal and gold, on both the clothes and the accessories. A rhythm that brings together different shapes and distinctive details, from “cropped” silhouettes and long petalled cuts, from striped patterns and Vichy designs, from flirty culottes and sophisticated organza dresses, completely hand-embroidered and trimmed with ruffles and large flounces. Meanwhile, a tableau vivant takes shape in the background. Like the footnote of a timeless tale that celebrates this important anniversary, weaving a precious thread between the story of yesterday and the passionate present that is MOSCHINO.